74 – M. Polly McKinstry, M.D. 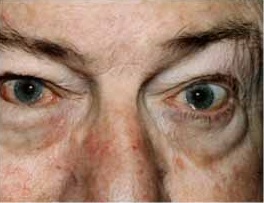 Lower Eyelid Malposition Entropion – This man had an irritated, red, tearing right eye due to a right lower eyelid entropion where the eyelid turned in so the eyelashes scratched against the eye. After entropion repair, the redness, pain and tearing are gone.